WTreeNode::PreLoading: the entire tree is transmitted to the client, and all tree navigation requires no further communication. WTreeNode::LazyLoading: only the minimum is transmitted to the client. When expanding a node for the first time, only then it is transmitted to the client, and this may thus have some latency. WTreeNode::NextLevelLoading: all leafs of visible children are transmitted, but not their children. This provides a good trade-off between bandwith use and interactivity, since expanding any tree node will happen instantly, and at the same time trigger some communication in the back-ground to load the next level of invisible nodes. The default policy is WTreeNode::LazyLoading. Another load policy may be specified using setLoadPolicy() on the root node and before adding any children. The load policy is inherited by all children in the tree. Do not display a child count. Always display a child count. Only display a child count when the node is populated. Pre-load one level of child nodes. 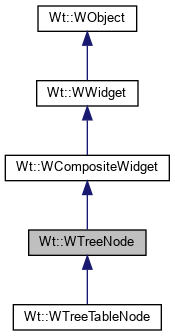 The image pack that is used for this tree node (deprecated). This method returns "" since Wt 3.1.1, as the image pack is no longer used in favour of the CSS themes. Sets the image pack for this (sub)tree (deprecated). This method does not do anything since Wt 3.1.1, as the tree is now styled based on the current CSS theme.